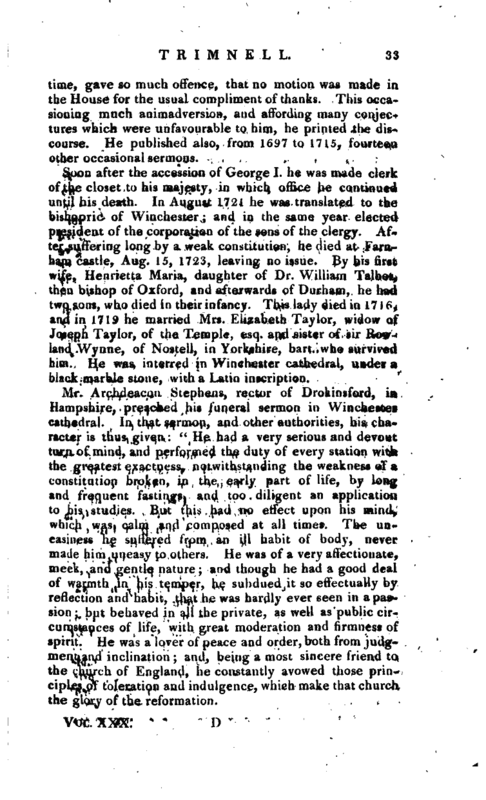 , successively bishop of Norwich and Winchester, was the son of the rev. 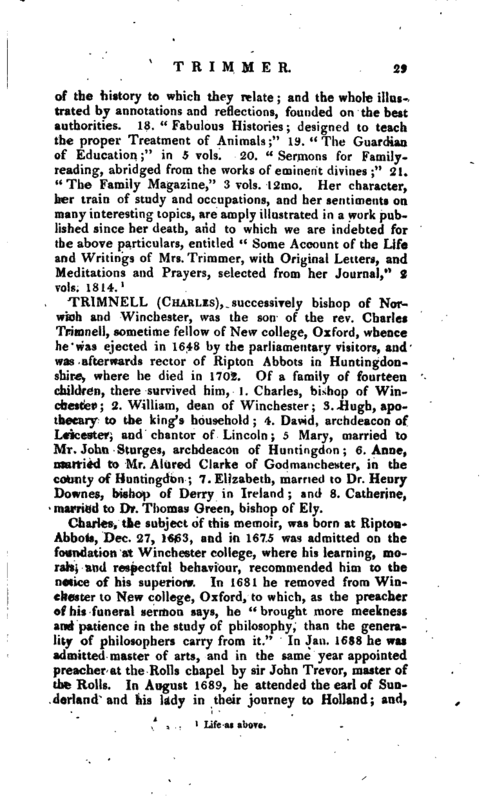 Charles Trimnell, sometime fellow of New college, Oxford, whence he was ejected in 1648 by the parliamentary visitors, and was afterwards rector of Ripton Abbots in Huntingdonshire, where he died in 1702. Of a family of fourteen children, there survived him, ). Charles, bi>hop of Winchester; 2. William, dean of Winchester 3. Hugh, apothecary to the king’s household 4. David, archdeacon of Leicester, and chantor of Lincoln 5 Mary, married to Mr. John Sturges, archdeacon of Huntingdon 6. Anne, married to Mr. Alured Clarke of Godmanchester, in the county of Huntingdon; 7. Elizabeth, married to Dr. Henry Downes, bishop of Derry in Ireland; and 8. Catherine, married to Dr. Thomas Green, bishop of Ely. Charles, the subject of this memoir, was born at RiptonAbbots, Dec. 27, 1663, and in 1675 was admitted on the foundation at Winchester college, where his learning, morals, and respectful behaviour, recommended him to the notice of his superiors. In 1681 he removed from Winchester to New college, Oxford, to which, as the preacher of his funeral sermon says, he “brought more meekness and patience in the study of philosophy, than the generality of philosophers carry from it.” In Jan. 1688 he was admitted master of arts, and in the same year appointed preacher at the Rolls chapel by sir John Trevor, master of the Rolls. In August 1689, he attended the earl of Sunderland and his lady in their journey to Holland; and, | after their return home, continued with them at Althorp, as their domestic chaplain. In Dec. 1691 he was installed prebendary of Norwich. In 1694, he was presented by the earl of Sunderland to the rectory of Bodington in Northamptonshire, which he resigned two years after on being instituted to Brington, in which parish Althorp stands, a living of no greater value than Bodington, although he was desired to keep both. In 1698 he was installed archdeacon of Norfolk, and procured leave of his noble patron to resign the rectory of Brington (at a time, when the remainder of his income did not exceed two hundred pounds per ann.) in favour of Mr. Downes (afterwards bishop of Derry in Ireland) who had married one of his sisters. On July the 4th, 1699, he was admitted doctor in divinity. In 1701 and 1702, during the controversy that was carried on in the Lower House of Convocation, he wrote some pieces in defence of the rights of the crown, and the archbishop; as, l. “A Vindication of the Proceedings of some Members of the Lower House of Convocation,” 1701, 4to. 2. “The Pretence to enter the Parliament-Writ considered,” 1701, 4to. 3. “An Answer to a third Letter to a Clergyman in defence of the entry of the Parliament- Writ,” 1702, 4to. 4. “Partiality detected,” c. a large pamphlet. About this time he was made chaplain in ordinary to queen Anne. In 1703 he was invited to appear as a candidate for the wardenship of New college in Oxford, by a great number of the fellows, who looked upon him as the fittest person to keep up that spirit of discipline and learning, which had been exerted, with the greatest credit and advantage to the college, under their late excellent warden Dr. Traffics. But, contrary to the hopes and expectations of his friends, the election was determined in favour of Mr. Brathwait. On this occasion, thirty - one voted for Mr. Brathwait, and twenty - nine for Dr. Trimnell on which the scrutators declared Mr. Brathwait duly elected. But, according to the canon law, no mail can vote for himself in an election per scrutinium; and it being found, that Mr. Brathwait’s own vote had been given for himself, it was insisted upon, that Mr. Brathwait could not be duly elected, because he had but thirty good votes, which was not the major pars pr&sentium required by the statutes, thereb eing sixty electors- present. 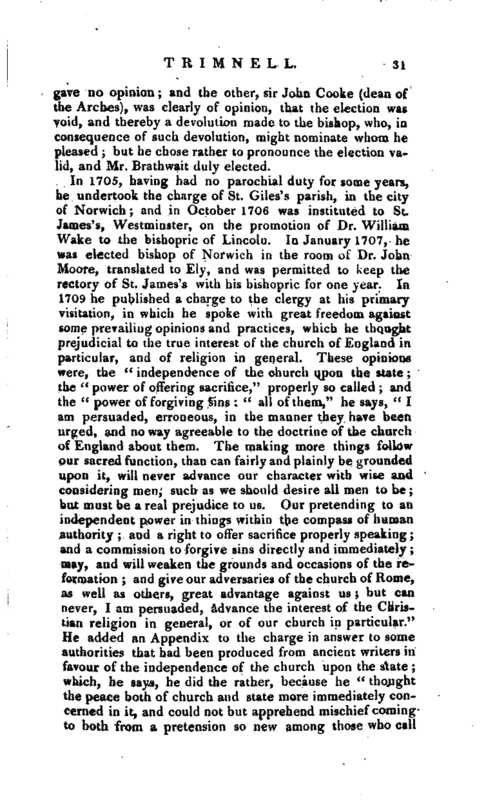 Upon this ground an appeal v>*as made to the visitor, Dr. Mews, bishop of Winchester, against the validity of the election. 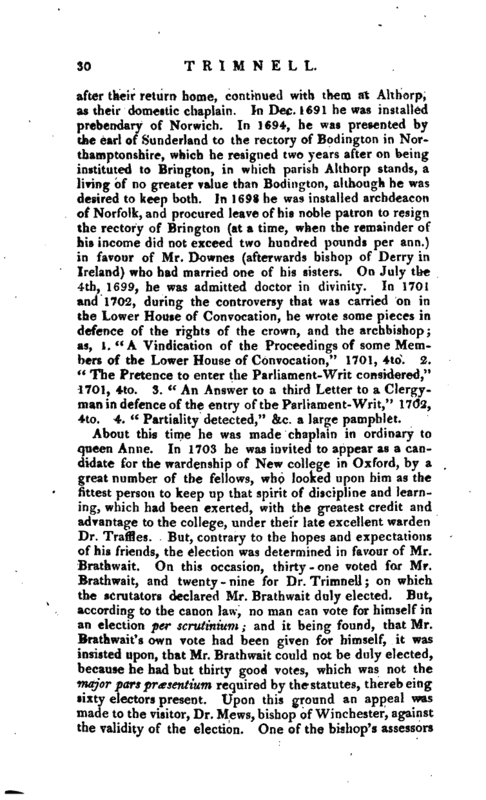 One of the bishop’s assessors | gave no opinion; and the other, sir John Cooke (dean of the Arches), was clearly of opinion, that the election was void, and thereby a devolution made to the bishop, who, in consequence of such devolution, might nominate whom he pleased; but he chose rather to pronounce the election valid, and Mr. Brathwait duly elected. In 1705, having had no parochial duty for some years, he undertook the charge of St. Giles’s parish, in the city of Norwich; and in October 1706 was instituted to St. James’s, Westminster, on the promotion of Dr. William Wake to the bishopric of Lincoln. In January 1707, he was elected bishop of Norwich in the room of Dr. John Moore, translated to Ely, and was permitted to keep the rectory of St. James’s with his bishopric for one year. In 1709 he published a charge to the clergy at his primary visitation, in which he spoke with great freedom against some prevailing opinions and practices, which he thought prejudicial to the true interest of the church of England in particular, and of religion in general. 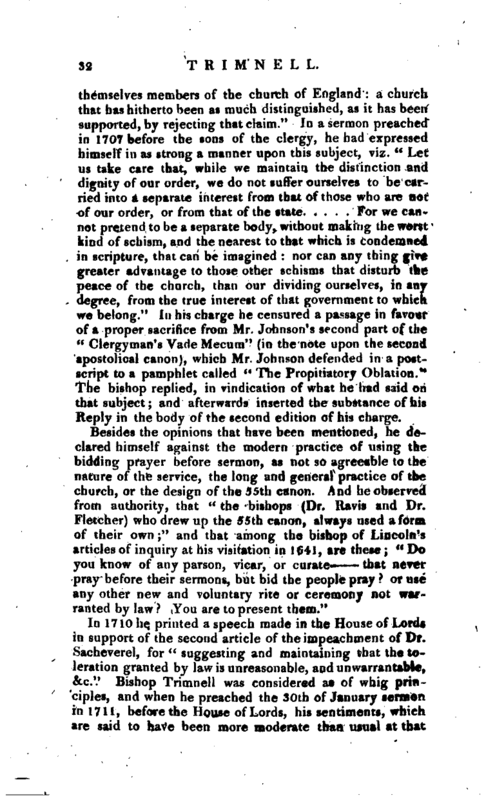 These opinions were, the “independence of the church upon the state; the” power of offering sacrifice,“properly so called; and the” power of forgiving sins: “all of them,” he says, “I am persuaded, erroneous, in the manner they have been urged, and no way agreeable to the doctrine of the church of England about them. The making more things follow our sacred function, than can fairly and plainly be grounded upon it, will never advance our character with wise and considering men, such as we should desire all men to be; but must be a real prejudice to us. Our, pretending to an independent power in things within the compass of human authority; and a right to offer sacrifice properly speaking; and a commission to forgive sins directly and immediately; may, and will weaken the grounds and occasions of the reformation; and give our adversaries of the church of Rome, as well as others, great advantage against us; but can never, I am persuaded, advance the interest of the Christian religion in general, or of our church in particular.” He added an Appendix to the charge in answer to some authorities that had been produced from ancient writers in favour of the independence of the church upon the state; which, he says, he did the rather, because he “thought the peace both of church and state more immediately concerned in it, and could not but apprehend mischief coming to both from a pretension so new among those who call | themselves members of the church of England: a church that has hitherto been as much distinguished, as it has been supported, by rejecting that claim.” In a sermon preached in 1707 before the sons of the clergy, he had expressed himself in as strong a manner upon this subject, viz. “Let us take care that, while we maintain the distinction and dignity of our order, we do not suffer ourselves to be carried into a separate interest from that of those who are not of our order, or from that of the state For we cannot pretend to be a separate body, without making the worst kind of schism, and the nearest to that which is condemned in scripture, that can be imagined: nor can any thing give greater advantage to those other schisms that disturb the peace of the church, than our dividing ourselves, in any degree, from the true interest of that government to which we belong.” In his charge he censured a pa*sage in favour of a proper sacrifice from Mr. Johnson’s second part of the “Clergyman’s Vade Mecum” (in the note upon the second apostolical canon), which Mr. Johnson defended in a postscript to a pamphlet called “The Propitiatory Oblation.” The bishop replied, in vindication of what he had said on that subject; and afterwards inserted the substance of his Reply in the body of the second edition of his charge. pray before their sermons, but bid the people pray? or use any other new and voluntary rite or ceremony not warranted by law? You are to present them." In 1710 he printed a speech made in the House of Lords in support of the second article of the impeachment of Dr. Sacheverel, for “suggesting and maintaining that the toleration granted by law is unreasonable, and unwarrantable, &c.” Bishop Trimnell was considered as of whig principles, and when he preached the 30th of January sermon in 1711, before the House of Lords, his sentiments, which are said to have been more moderate than usual at that | time, gave so much offence, that no motion was made in the House for the usual compliment of thanks. This occasioning much animadversion, and affording many conjectures which were unfavourable to him, he printed the discourse. He published also, from 1697 to 1715, fourteen other occasional sermons. Soon after the accession of George I. he was made clerk of the closet to his majesty, in which office he continued until his death. In August 1721 he was translated to the bishopric of Winchester; and in the same year elected president of the corporation of the sons of the clergy. After suffering long by a weak constitution, he died at Farnham castle, Aug. 15, 1723, leaving no issue. By his first wife, Henrietta Maria, daughter of Dr. William Talbot, then bishop of Oxford, and afterwards of Durham, he had two sons, who died in their infancy. This lady died in 1716 ti and in 1719 he married Mrs. Elizabeth Taylor, widow of Joseph Taylor, of the Temple, esq. and sister of sir Rowland Wynne, of Nosteil, in Yorkshire, hart, who survived him. He was interred in Winchester cathedral, under a black marble stone, with a Latin inscription. Mr. Archdeacon Stephens, rector of Drokinsford, in Hampshire, preached his funeral sermon in Winchester cathedral. In that sermon, and other authorities, his character is thus given: “He had a very serious and devout turn of mind, and performed the duty of every station with the greatest exactness, notwithstanding the weakness of a constitution broken, in the early part of life, by long ant! frequent fastings, and too diligent an application to his studies. But this had no effect upon his mind, which was calm and composed at all times. The uneasiness he suffered from an ill habit of body, never made him uneasy to others. 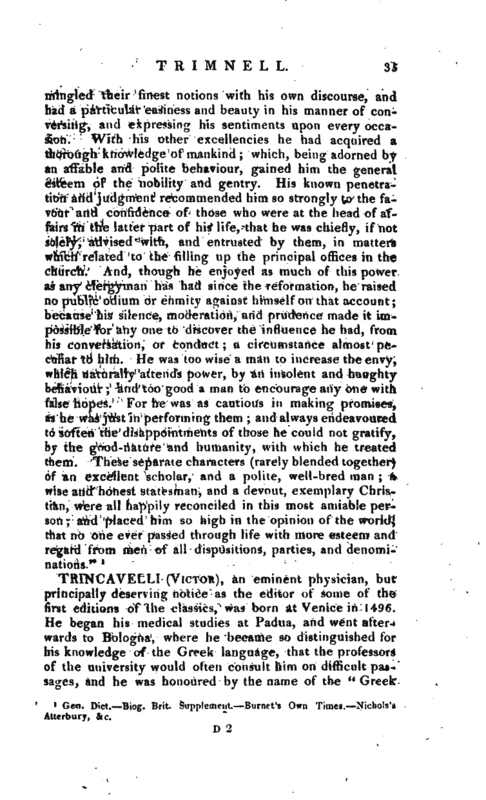 He was of a very affectionate, meek, and gentle nature; and though he had a good deal of warmth in his temper, he subdued it so effectually by reflection and habit, that he was hardly ever seen in a pas*, siott^ but behaved in all the private, as well as public circumstances of life, with great moderation and firmness of. spirit. He was a lover of peace and order, both from judgment and inclination; and, being a most sincere friend to the church of England, he constantly avowed those principles” of toleration and indulgence, which make that church the glory of the reformation. | "There are letters extant, by which it appears, that he was very diligent in examining the arguments urged on both sides, before he took the oaths to king William and queen Mary, which he religiously observed by a steady and uniform attachment to the Revolution-interest, as longas he lived. No man ever supported the character of a bishop with greater dignity and authority, and yet no one was ever more beloved by the clergy of both his dioceses; for he was very courteous and obliging, and easy of access to all, and had a strict regard to those parts of behaviour which are most suitable to the profession of a minister of the gospel. His rebukes were conveyed in few words, and those delivered with a sort of uneasiness for the necessity of them: but although they were few, and smoother than oil, yet were they very swords; for to an understanding heart they seemed to receive an aggravation of anger, from that very meekness which endeavoured to soften them. He was of a temper incapable of soliciting favours for himself, or his nearest friends, though he had the tei/derest affection for them. He was very much displeased at the appearance of an importunate application in others, and always avoided it in his own conduct. And notwithstanding all his relations have prospered very much in the world by his means, their success has been owing rather to the credit and influence of his character, than any direct applications made by him. The nobleness of his mind appeared in many other instances; in his candour and generosity of spirit, and contempt of money; of which he left so many marks in every place where he lived, that he had neither ability, nor occasion, 1 to perpetuate his memcry by any posthumous charities. 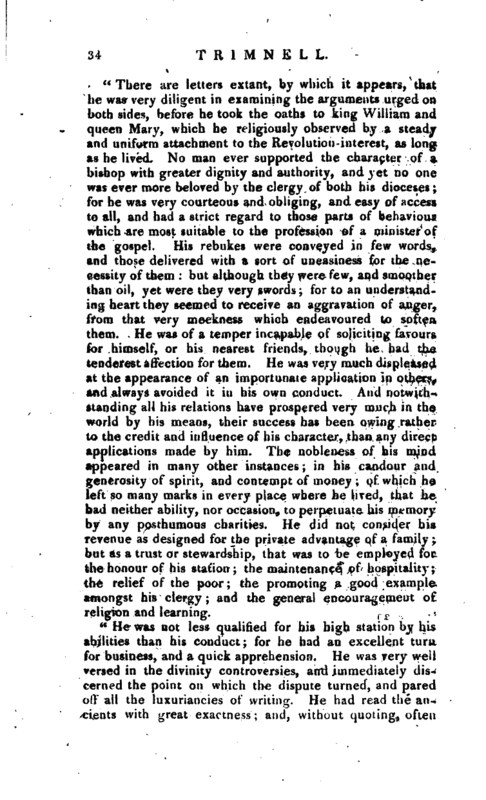 He did not consider his revenue as designed for the private advantage of a family; but as a trust or stewardship, that was to be employed for the honour of his station; the maintenance of hospitality; the relief of the poor; the promoting a good example amongst his clergy; and the general encouragement of religion and learning. 1 Gen. Dict. Bio. Brit. Supplement. Bur.ut’s Own Times. Nichols’s Atterbtiry, &c.